Born Tony Charles Scott in 1935 to parents Doug and Molly and raised in Bute Street,Treorchy, in the beautiful Rhondda Valley, Wales, the would be wrestling legend initially suffered from chronic asthma and took up the then popular Charles Atlas bodybuilding course, which used isometric tension as the main ingredient, to increase his lung capacity. Whilst still at School,his parents moved to Bristol looking for work, leaving the youngster with his Grandmother. Tony's athletic qualities soon became apparent and he took up gymnastics, athletics and rugby, representing Rhondda valley Schools at all three, which served to enhance his now muscular physique. On completing his education at Pentre Secondary School, he joined his folks in Bristol, in 1951,where the real story began, he eventually joined the Bristol Youth Club programme by enrolling for amateur wrestling and judo lessons. Within three weeks, he had his first bout, being pinned twice within 50 seconds of each round ! Undeterred however , Tony persevered over the next few years at the age of eighteen was Eastern, Western, and Midlands areas Champion. He also fought for the British welterweight title four times, winning a bronze medal. Interrupted by a stint in the RAF following call up, he continued his training on demob, and in 1958 at 23 years old, the young gladiator represented his beloved home Country : Wales in the Empire Games at Cardiff stadium, also winning a bronze medal.It was at this prestigious event that he met and befriended Howard Winstone, a boxer who was competing and who would become a lifelong pal as well as legendary fighter. During the same year, the master grappler turned Professional under the name of TONY CHARLES where his speed and skill soon took the welterweight into the top division. he faced legends such as George Kidd, Mick McManus, Al Miquet plus many more and everyone who met the Welshman, agreed that he was destined for great glory, and on one occasion he held the late great Jack Dempsey to a 15 round draw for the British Welterweight Championship. His reputation continued to grow as did his physique training , doing upwards of an incredible 200 push-ups at once followed by Indian club swinging which became a life long love, continuing throughout his seventies. Tony's weight took him into the middleweight Division, where he took on men such as Bert Royal, whom he considered to be one of the greatest exponents in the ring, then on upwards into the Light heavyweight ranks against his favourite opponent : Clayton Thompson, and with whom he had some of the most exciting bouts on record, earning countless standing ovations from appreciative audiences. He fought a terrific contest against the formidable Mike Marino for the British heavyweight title yet again being held to a draw, but attracting a ten minute standing ovation including one from Marino himself. 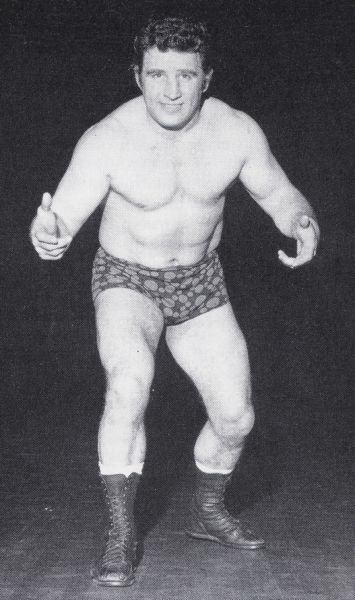 Billy Joyce revered as one of the toughest shoot wrestlers ever to come out of the North, likened Charles to a wrestling machine that he had the greatest respect and liking for. Alongside his solo career, Tony Charles would often team up with fellow Welshman Adrian Street and appear as the 'Welsh Wizards', much to the delight of fans, but as Ada's own reputation was increasing rapidly, his alter ego as a bad guy, belied the clean cut image that he depicted with Charles and so the pair split up for Street to turn to 'Bad boy' Bobby Barnes which suited his new found image. Tony meanwhile, then joined forces with Clayton Thompson making the perfect pure wrestling duo. Adrian meanwhile, privately remained friends and their close association lasted until Tony's premature death , a fact that has devastated both Adrian and Linda Street. 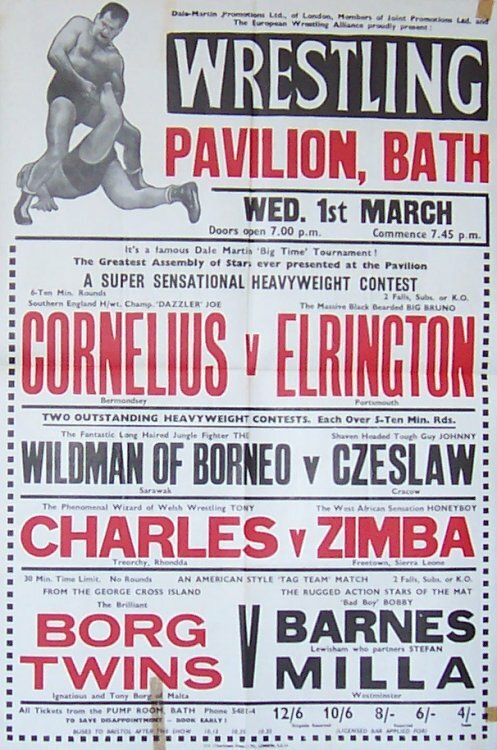 Through the 60's and 70's Charles became a household name touring around every venue in Geat Britain, and was also a firm favourite with TV audiences, appearing in excess of 70 times against every big name from every weight division that existed. That record has never been beaten, even by stars such as Big Daddy, Mick McManus, Jackie TV Pallo , Giant Haystacks or even Les Kellett. 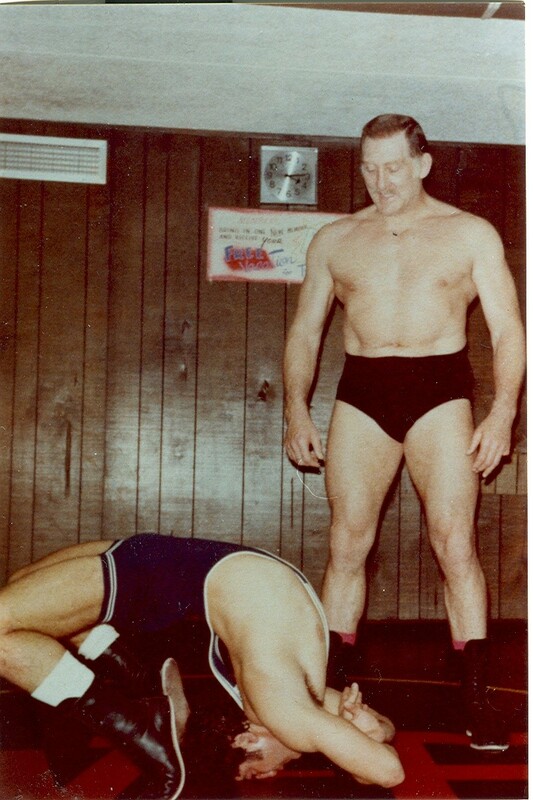 In 1973, he first worked in Florida, booked by Eddie Graham as a technical wrestler against Les Thornton, against whom he had some amazing skilfully crafted bouts and with whom he would later tag in matches against Robinson and Co. In latter years, Charles would often also be known as 'The Checkmate' as part of Devastation Inc. 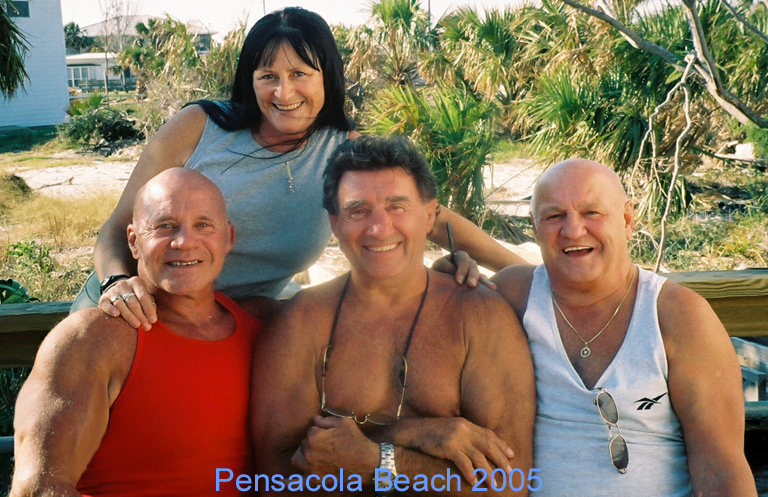 Following the increasing demand for his services in America, Tony took his family : wife Pamela, and children Kim, Susan and Anthony to Florida, where he settled into the new life that would become his main love until his recent demise.The family bought a property in Pensacola where Adrian Street and Linda were also to settle 20 miles away,on the Gulf of Mexico known as Gulf Breeze and despite losing his home to a Hurricane, forcing the family to move into a mobile home temporarily whilst his own was rebuilt, never lost his love of the scenic beauty from that area. 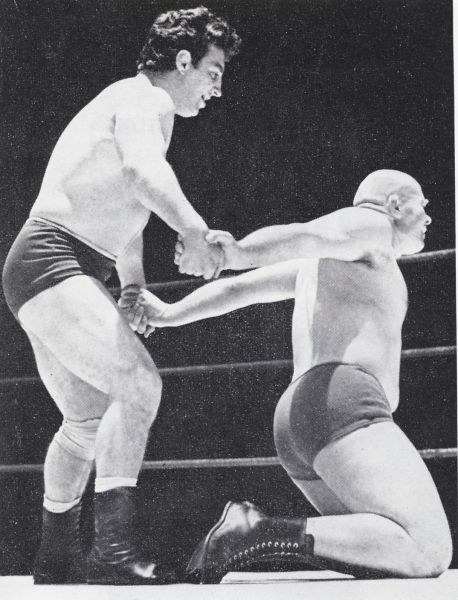 Master shooter : Karl Gotch with whom he had toured Japan and pulled with many times outside the pro ring, became a buddy and near neighbour and the two would train into their late life. 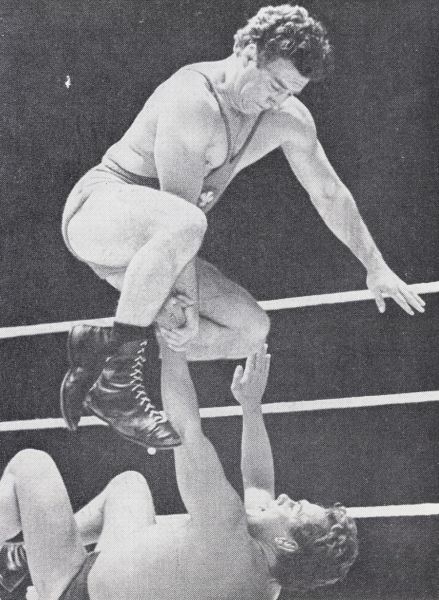 Gotch who was virtually unbeatable as a shoot wrestler, able to take a submission on every three inches of the body, likened Tony Charles to the epitome of the most perfect wrestler that he had ever met. That was some testimony to the Welsh fighter. Sadly, the effects of Alzeimers were becoming more apparent during recent years and on one occasion Adrian Street who was an inseparable friend, with Tony's daughter even being book keeper for Adrian and Linda's Business matters, was reminiscing at a wrestling match about the old days where they were honouring Street, and Tony didn't even know that he had been a wrestler, let alone one of the greatest Legends that ever lived ! He died peacefully with his family at his bedside, on the 13th February 2015, putting the worlds wrestling family into mourning at the loss of the third legend in as many months. Tributes have been received from World wide, led by Adrian and Linda themselves and fellow British greats : Jon Cortez, Al Miquet,Tony Scarlo, Wayne Bridges, Johnny Kincaid, Romany Riley, Colin Joynson, Marty Jones, Banger Walsh, and more. Sad to here of another great person taken so early by this cruel disease. Chris WrestlingFurnace A sad loss of a superb athlete who was a credit to, and a great ambassador for, British Professional Wrestling. 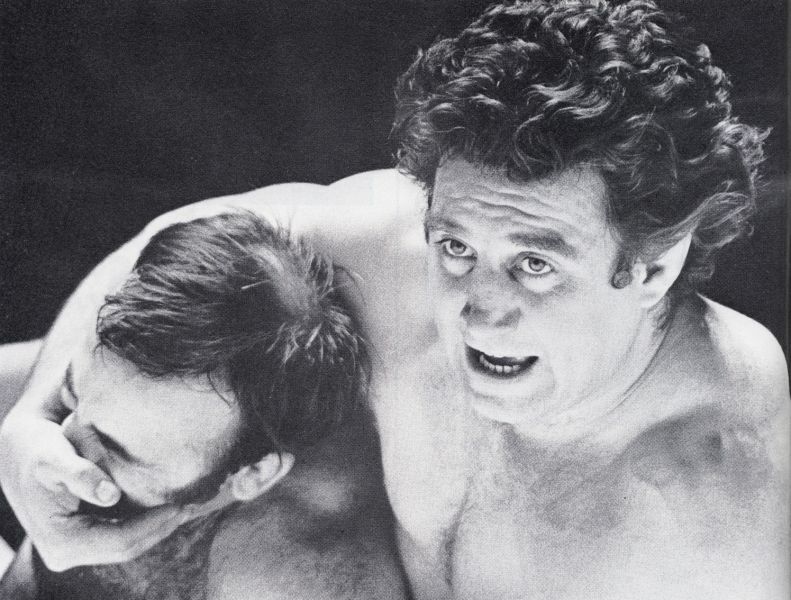 David Franklin A sad loss to wrestling, Tony Charles really was one of the very best and those of us lucky enough to see him in his prime will never forget how lucky we were. RIP a real legend. John White Another sad loss to the wrestling world. Tony Charles was a very good wrestler in his day. What a great wrestler Tony Charles was. Still remember when he and Les Thornton held the Texas Tag Team titles for Fritz and they were a very popular team indeed. RIP to Mr. Charles and condolences to his family and friends. 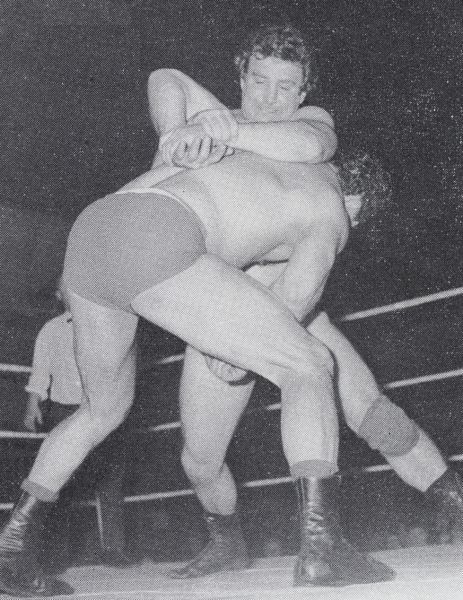 Adrian Street Tony was my first regular tag-partner - 'The Welsh Wizards' over 50 years ago. We have been friends since 1961. Tony lived only about 20 miles from my front door. His ashes will be scattered over the beautiful beaches of the Gulf of Mexico that we all love so much. I remember him best from his run in Southeastern Championship Wrestling back in the mid 70's.He will be missed.EXCELLENT wrestler. Frank Rimer Commonwealth Games, Empire Games, Wrestled for Wales many times, Top International Professional, the man had it all. What a legend ! R.I.P. Paul Ashe Sincerest condolences Adrian Street . Tony was incredible to watch and an incredible star. 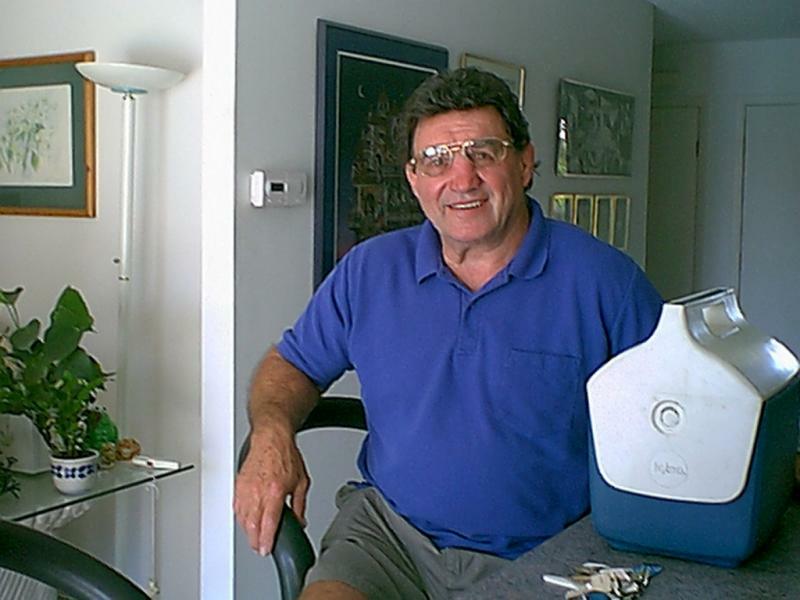 James Fitzmaurice Rest in peace Tony. Adrian Street From one GREAT WRESTLER - Alan Miquet to another, the GREAT TONY CHARLES. 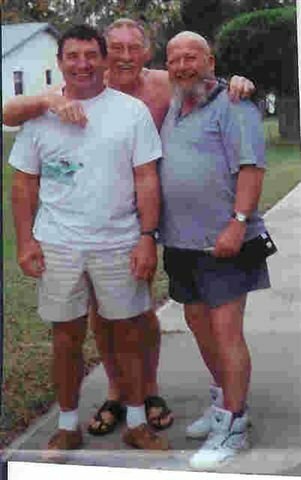 Peter Gurr sorry to here tony pass away he gave me some good advise many years ago r I p tony Peter. Adrian Street The Welsh Wizards - Tony Charles & Adrian Street are in 'SADIST IN SEQUINS.' - Amazon - Kindle - Nook - signed copies from rupetbear on eBay. Tony Charles was a great athlete, a great wrestler both Amateur and Professional, a credit to himself, his Family, his homeland Wales, his adopted Country the U.S.A. and the World of wrestling. Aptly described by all as :- The perfect wrestler and the perfect gentleman.